Jeffrey’s staying in Buffalo this week, in search of snow that’s oddly missing. Typically, the snow hits several hours after he leaves town. What we don’t know is why Jeff’s causing snow to fall everywhere, but only after he leaves town. Tim and Summer can only giggle at the unique predicament. The crew also fuels the “Lost Tales” rumor mills, as best as the most insatiably curious fans can. We aren’t helping one bit… yet. Tim and Summer continue the Season 2 episode discussion with “Revelations”, a busy yet important episode, in that many secrets from the first season are brought to light, and the seeds for more secrets are sown. G’Kar is still on a mission to uncover what really happened in Quadrant 37, and barely escapes with his life; Delenn emerges from her cocoon, a completely different being from the one who entered it; Garibaldi is awakened from his coma still unaware of who shot him or whether the plot he stumbled across was foiled; Sheridan’s sister arrives with an unrevealed message from the past, and all of that merely scratches the surface of what happens in this episode. Tim and Summer debate and discuss what they can before time runs out. Listener Feedback: We finish up the most recent backlog of voicemails: Steven Nelson recounts a tale of his encounter with Stephen Furst at a recent BayCon, and a filking of “Mollari”; Jarsto comments on our discussion from Show #31 about the rogue Lurker teep, and his feelings on “Crusade”; Jarsto again, commenting on Show #34 and how the names of the Earth Alliance battleships foreshadow events in the series. 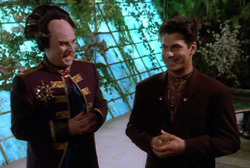 Tim reads an email from David asking for a reality check, making sure that somewhere deep down Tim understands that Babylon 5 is just a story… right? We may start collecting B5 fan tales for future segments, so start sending those in. And we promise to try to keep Tim from singing in the future. I’m going to the Supanova convention in Sydney this weekend, and Mira Furlan is a guest there. There have been no announcements that she is pulling out, so I will let you know after the weekend if she has to pull out of this one too. thanks, Grenge – let us know! Great news Kurt, thanks for the Link.